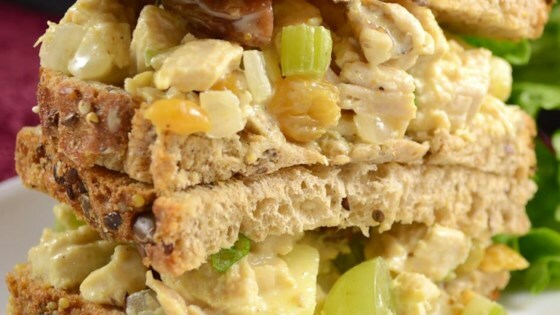 "A healthy and tasty chicken salad with a fruity twist - great on a croissant or in a honey pita. Note: This salad is best if eaten the day after preparation. This allows the ingredients time to mingle, giving a fuller flavor. If desired, use nonfat mayonnaise." In a large bowl combine the chicken, celery, onion, apple, raisins, grapes, pecans, pepper, curry powder and mayonnaise. Mix all together. Serve! See how to make a tasty curry chicken salad with lots of healthy fruit. Tried this and the curry is just way too strong!! I even did less than the recipe asked for?? :( Guess we just don't like curry. I served this recipe on croissants at at women's seminar. They are still talking about how good the sandwiches were. Thanks for the recipe!